of Bel-Air was a TV fave. It's the morning after Christmas and I'm sipping a delicious cup of Sumatra in bed, playing Words with Friends and watching The Fresh Prince of Bel-Air. What better way to spend a day off? Don't be jealous, I have plenty of chores planned for the day. I'd never let a day off go to waste without vacuuming, mopping and laundry. Remember Fresh Prince of Bel-Air? Remember Will Smith before he became a mega star? Before he had babies? Before divorce announcements? The Fresh Prince of Bel-Air came just in time for Will Smith. He had been in trouble with the IRS for underpaying his taxes. The show financially saved him and helped his career big time! Here are some fun facts about The Fresh Prince of Bel-Air. 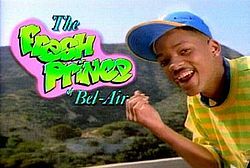 The Fresh Prince of Bel-Air first aired in September of 1990. I was a freshman in college. Life was one big party back then. Twenty-two years later, I can sing along to the theme song. In the late 1990s, I interviewed Tatyani Ali who played Will's little sister, Ashley. Like me, Ashley was from Long Island. Who could forget first lovin' Alfonso Ribeiro from Silver Spoons? Oh heavens...I loved that show. Don't tell anyone, k? I'm an unbelievable doofus! Loved the show! Loved Carlton! Loved that show! Loved Carlton! Great humor and family fun. yes but can you "do the Carlton?" heheheh BEL AIR! :D I love Will Smith, he's a great actor!